I worked at the Gloucester baths in the 1950s. There were two swimming pools in the main building and a much smaller one in the Turkish bath part. The Turkish bath was quiet and apart and really very nice as I remember, there were it seems to me about seven hot rooms and steam rooms also of course the small pool and a large resting room with beds always kept very clean with fresh linen. People would come first thing in the morning and spend several hours in the steam and hot rooms and then showered and rested and sometimes napped in this large room and were served tea and toast if desired. There were probably about ten cubicles for changing where people could leave their possessions. And always a good supply of clean towels. This was quite a private area and the staff always had to be aware of which day it was because there were mens and womens days. We had two lady masseuses and one male masseur and once in a while someone would forget and we usually had a good laugh when that happened…. There was also a laundry in the back upstairs which also laundered sheets and towels for several businesses in Gloucester. It was very hot in there and I was always happy to go back there in the cold winter mornings. On both sides of the front entrance there were slipper baths about 10 or so each side I think and this was quite a busy place since many men who worked at the foundry and the railway would come in every evening to bathe before going home, I am sure their wives were very happy, the men obviously were very sooty and many of them would not get on the bus to go home until they cleaned up. There were two older men who worked in this area and they were funny and were very tolerant of us young folk who worked in the office and cashier booth. There was always an attendant in the pool areas and more on the busy days. The local schools came in regularly and also soldiers from Gloucester barracks, on those days if I had to go to the back from the office to the laundry I used to go down into the basement where all the pipes and stuff were, to get to the laundry. I didn’t much like it but was too self conscious to walk through the pool with all the soldiers. The pool staff were all properly trained and we also had swimming instructors who were fully qualified, I remember one lady had actually swum the channel. I think she emigrated to Australia. I especially remember the man who took excellent care of the workings, a lady once lost a diamond out of her engagement ring while swimming and he actually found it in the filters, a very conscientious man who was very highly regarded. When I first started working there, the baths superintendent was a man named Lusher and a little while after, he left for a position in Warrington and the new man was called Thorne who I believe was a Navy man,very very proud to be British (perhaps that’s where I got it from). In the winter one of the pools was covered up and I think it was hired out for racquet games or something like that, and there were billiard tournaments held there with famous players. However, the most exciting times were the wrestling matches held regularly, they were very colourful characters and at first I was rather afraid of them, they were so unusual looking, but after a while I grew more comfortable especially after one of them explained to me that it was only SHOW BUSINESS and they were quite ordinary fellows really. I remember we had a swimmer who came in every day to train, not sure if he was in the Olympics or was training for the Olympics, he had quite a following and something of a celebrity – seems to me his name was Geoffrey. I think the baths were very well run and I enjoyed my time there, sometimes the mayor and other officials would visit and I think even Sir George Dowty came for some reason. 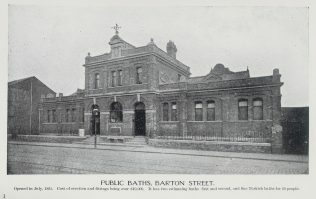 The photograph of the Baths was taken in about 1900, and you can find a brief history of them here. My father was Peter Lusher, mentioned in the above. I was born in 1950 and we moved to Gloucester the following year and we left in 1958 not for Warrington as suggested, but for Tottenham in London. I don’t know if his successor was a navy man, but my father certainly was and served in the Royal Navy from 1936 until the end of the war. An article and photo about his leaving can be found in The Citizen for January 10 1958. We lived in an upstairs flat at 87 Barton Street (now part of Eastgate) which went with the post, and which I remember vividly. It was part of a larger building known as Charlton House with shops below (the Pop-in Café?) and separated from the Baths by the entrance to a rough surfaced ‘parking’ area. This site is now occupied by the present Leisure Centre. The Swimming Baths and the area between were my playground. I am sure Jacqueline Rees Adams will remember me as that very naughty little boy, known as Rickie then! At pre-school age according to my mother, I was apparently well-known to the police as I had a habit of escaping through the cat-flap and wandering the streets. On one occasion, out shopping with my mother, a police woman grabbed hold of me – ‘Gotcha! I’m taking you straight home.’ – my mother protesting bitterly. When I got too big for the cat-flap, I threw a chair downstairs so I could reach the lock! When sweet rationing ended in 1953, my mother was approached by a shopkeeper and asked when she was going to settle the bill – she was taken aback, as it was not a shop she used. Apparently, I had asked for sweets and told the shopkeeper that my mother would pay! Incidentally, we normally went to Mr Bertram’s which was the first shop on the opposite side of the road. I found the plant room at the back of the Baths to be a fascinating place to play, with those huge wheels to turn – I almost succeeded in draining one of the pools! I know that Gloucester was sorry to see my father leave, but not perhaps so for his son?